Ok so, everyone knows that the trip to the dentist is a dreadful one. I doubt theres anyone walking the planet that actually looks forward to that appointment. Just the thought of the tools, needles, suctions and laughing gas is enough to make you cringe. Well, maybe we dont mind the laughing gas so much but everything else gives us goosebumps! While we cant take away the fear of the dentist visit or make it an enjoyable one, we can certainly give you some fun, challenging dentist riddles instead! In our collection of dentist riddles, we have everything from Who Am I? riddles to funny dentist riddles for kids and riddle puns! Some may be a little of a challenge, but hey, it beats getting a cavity filled, right? Check out some of the best dentist riddles below! What is a drill sergeant? Why did the Oreo go to the dentist? What do a dentist and a tennis coach have in common? Whats the difference between a person with a terrible toothache and a rainy day? One is roaring with pain; the other is pouring with rain. I'm white, and used for cutting and grinding. When I'm damaged, humans usually remove or fill me. For most animals I am a useful tool. What am I? I dig out tiny caves, and store gold and silver in them. I also build bridges of silver and make crowns of gold. They are the smallest you could imagine. Sooner or later everybody needs my help, yet many people are afraid to let me help them. A Buddhist went to the dentist for a root canal, but he refused novocain, why? 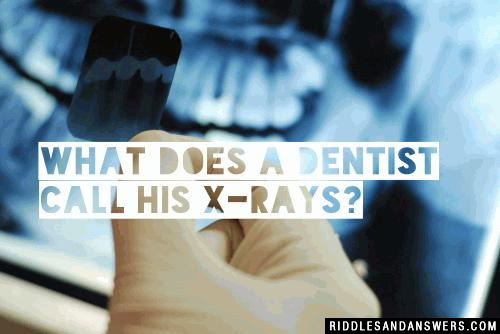 Can you come up with a cool, funny or clever Dentist Riddles of your own? Post it below (without the answer) to see if you can stump our users.